You must buy this now or live with regret and no-one wants that. I presume I have your attention with that recommended bait headline. 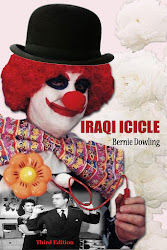 I would like to explain that Bernie Dowling’s neo-noir crime novel Iraqi Icicle 2nd Edition is now available world-wide in print and as an eBook. Reason 1. 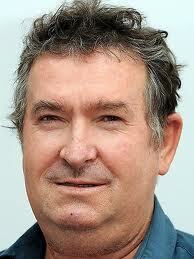 In print it is available from Amazon and Google Books and their subsidiaries. Reason 3. More than 40 countries around the world have a book stores which can order in a copy. You probably live in only one of those countries but surely it is a comfort to know you can move to any of the other 40 or so and still order a copy. Reason 4 The Postman Always Rings Twice if you order a mail copy twice. Disclaimer: this does not apply in countries where post men and women do not ring at all. Reason 5. At many places online, you can read a fifth of Iraqi Icicle for free. If you are not hooked by then, there is no pleasing you. Reason 6. Well respected book magazine Publishers’ Weekly gave Iraqi Icicle a well-deserved good review. Read it HERE. (That’s the review not the novel. You have to buy the novel after you read the review to read Iraqi Icicle. Your copy of Iraqi Icicle 2nd edition is just a Google away. Google it now. Or maybe later. No, do it now. You might forget to do it later. I rather like this old ditty. And what's not to like.